Power is supplied by Kubota V1505, 4 cylinder water cooled diesel engine that produces 35hp. The TW 150vtr has an 18 litre (4 gallon) fuel tank and can chip for up to 5-7 hours without refueling. On the back of the rotor are 10 aerodynamic fans that create positive air pressure within the rotor housing; this enables the TW 150vtr to handle extremely leafy or wet material without blocking. 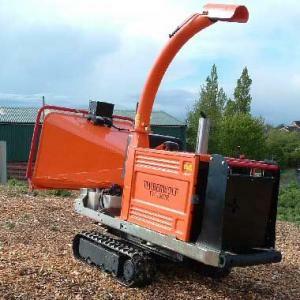 This chipper gives superb performance regardless of the weather, season or type of material being processed! The TW 150vtr has a high discharge tube designed to load efficiently straight into the back of a truck. If required, the discharge tube can easily be rotated through 270 degrees and the discharge bucket can be adjusted so the chips can be placed exactly where the operator wants them. The TW 150vtr chipping performance comes from 2 blades. Mind you, they are not just any old blade; the 100mm (4�) blades are made from a special Swedish steel that has been developed specifically for large scale commercial chipping. The blades are extremely tough without being brittle and can process many tonnes of material before they need sharpening.